The FUNcube Dongle simple fits into your computer’s USB port. It’s compatible with many radio reception programs like Rocky, M0KGK, Spectravue and LinRad. 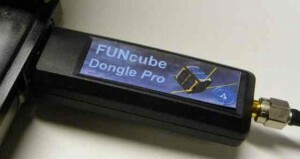 The FUNcube Dongle also works with Windows XP, Vista and Windows 7 both x86 and x64. In addition, it is compatible with Linux and MacOS as it uses standard USB drivers already integrated into the operating system. A Radio Astronomy paper describes the use of the AMSAT-UK FUNcube Dongle Software Defined Radio as part of a Radio Telescope. In the paper Dr David Morgan of the British Astronomical Association Radio Astronomy Group (BAA-RAG) describes how he used the FUNcube Dongle as the heart of a Radio Telescope operating on 1420 MHz. He concludes that “A newly available SDR component has been shown to be very capable of acting as the heart of a simple and inexpensive three component radio telescope”. You can download the paper ‘Experiments with a Software Defined Radio Telescope’ by Dr David Morgan at An SDR Radio Teles Funcube Dongle master website.cope. There is a lot of software that supports the Funcube dongle. Take a look at the Software section.